Born to pagan parents; his father was a Roman military officer and tribune. Martin was raised in Pavia, Italy. Discovered Christianity, and became a catechumen in his early teens. Joined the Roman imperial army at age 15, serving in a ceremonial unit that acted as the emperor's bodyguard, rarely exposed to combat. Cavalry officer, and assigned to garrison duty in Gaul. Baptised into the Church at age 18. Trying to live his faith, he refused to let his servant to wait on him. 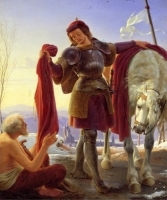 Once, while on horseback in Amiens in Gaul (modern France), he encountered a beggar. Having nothing to give but the clothes on his back, Martin cut his heavy officer's cloak in half, and gave it to the beggar. Later he had a vision of Christ wearing the cloak. This incident became iconographic of Martin. Just before a battle, Martin announced that his faith prohibited him from fighting. He was charged with cowardice, was jailed, and his superiors planned to put him in the front of the battle. However, the invaders sued for peace, the battle never occurred, and Martin was released from military service at Worms, Germany. Spiritual student of Saint Hilary at Poitiers, France. On a visit to Lombardy to see his parents, Martin was robbed in the mountains - but managed to convert one of the thieves. At home he found that his mother had converted, but his father had not. The area was strongly Arian, and openly hostile to Catholics. Martin was badly abused by the heretics, at one point even by the order of an Arian bishop. 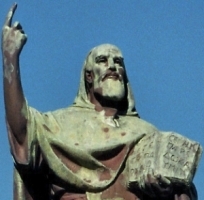 Learning that the Arians had gained the upper hand in Gaul and exiled Saint Hilary, Martin fled to the island of Gallinaria (modern Isola d'Albenga). Learning that the emperor had authorized the return of Hilary, Martin ran to him in 361, then became a hermit for ten years in the area now known as Ligugé. A reputation for holiness attracted other monks, and they formed what would become the Benedictine abbey of Ligugé. Preached and evangelized through the Gallic countryside. Many locals held strongly to the old beliefs, and tried to intimidate Martin by dressing as the old Roman gods and appearing to him at night; Martin destroyed old temples, built churches on the same land, and continued to win converts. Friend of Saint Liborius, bishop of Le Mans, France. When the bishop of Tours, France died in 371, Martin was the immediate choice to replace him. Martin declined, citing unworthiness. 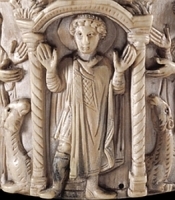 Rusticus, a wealthy citizen of Tours, claimed that his wife was ill and asking for Martin; tricked by this ruse, Martin went to the city where he was declared bishop by popular acclamation, and then consecrated on 4 July 372. As bishop, he lived in a hermit's cell near Tours. Other monks joined him, and a new house, Marmoutier, soon formed. He rarely left his monastery or see city, but sometimes went to Trier, Germany to plead with the emperor for his city, his church, or his parishioners. Once when he went to ask for lenience for a condemned prisoner, an angel woke the emperor to tell him that Martin was waiting to see him; the prisoner was reprieved. Martin himself was given to visions, but even his contemporaries sometimes ascribed them to his habit of lengthy fasts. An extensive biography of Martin was written by Sulpicius Severus. He was the first non-martyr to receive the cultus of a saint. Martin knew long in advance the time of his death and he told his brethren that it was near. Meanwhile, he found himself obliged to make a visitation of the parish of Candes. The clergy of that church were quarreling, and he wished to reconcile them. Although he knew that his days on earth were few, he did not refuse to undertake the journey for such a purpose, for he believed that he would bring his virtuous life to a good end if by his efforts peace was restored in the church. He spent some time in Candes, or rather in its church, where he stayed. Peace was restored, and he was planning to return to his monastery when suddenly he began to lose his strength. He summoned his brethren and told them he was dying. All who heard this were overcome with grief. In their sorrow they cried to him with one voice: "Father, why are you deserting us? Who will care for us when you are gone? Savage wolves will attack your flock, and who will save us from their bite when our shepherd is struck down? We know you long to be with Christ, but your reward is certain and will not be any less for being delayed. You will do better to show pity for us, rather than forsake us." Thereupon he broke into tears, for he was a man in whom the compassion of our Lord was continually revealed. Turning to our Lord, he made this reply to their pleading: "Lord, if your people still need me, I am ready for the task; your will be done." Here was a man words cannot describe. Death could not defeat him nor toil dismay him. He was quite without a preference of his own; he neither feared to die nor refused to live. With eyes and hands always raised to heaven he never withdrew his unconquered spirit from prayer. It happened that some priests who had gathered at his bedside suggested that he should give his poor body some relief by lying on his other side. He answered: "Allow me, brothers, to look toward heaven rather than at the earth, so that my spirit may set on the right course when the time comes for me to go on my journey to the Lord." May have been a camel driver in civilian life. Soldier in the imperial Roman army, serving under Firmilian. During the anti-Christian persecutions of Diocletian and Maximian, Menas left the army for his own safety, and so he would not in any way support such a regime. He retired for a while as a mountain hermit. During a great pagan festival, Menas came down from the mountains to preach Christianity in Cotyaes, Phrygia. He was tried for his faith before the Roman prefect Pyrrhus, scourged, tortured and martyred. His grave in Egypt became known as a place of miracles, and a basilica built over his grave became one of the great sanctuaries of Christendom; it was called the glory of the Libyan desert. Merchants travelling through the area spread stories about him, and churches built in his honour at Cotyaeus and Constantinople gave rise to local legends about him. The basilica was destroyed and his tomb lost in the seventh century, and was rediscovered in an archeological expidition in 1905. Born to a pious, orthodox Eastern Rite family, Peter was educated in Strem (in modern Austria) and Adrianopolis (modern Edirne, Turkey). He joined the Congregation of the Assumption on 8 September 1910 in Gemp, taking the name Kamen. Professor at the College of Saint Augustine in Plovdiv, Bulgaria in 1918. Teacher at the Little Seminary of Koum Kapou in Istanbul, Turkey. Professor of theology in Kadiköy, Turkey in 1920. 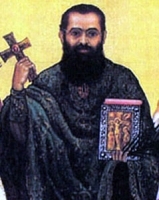 Ordained in the Eastern rite on 22 December 1921. Kamen studied in Rome, Italy, and in Strasbourg, France, and received his doctorate in theology in 1929. He returned to the College of Saint Augustine in Plovidiv in 1930 where he served as teacher, college rector, dean of studies, and lecturer in philosophy. He was known as a stern authority figure who expected much from his students; they responded, academic standards were high, and he received great respect. Along with his work, he wrote for several magazines on matters relating to science and religion, often using pen names. On 2 August 1948 the Communists closed the College, and Father Kamen was named superior of the seminary of Plovdiv. When the Communists expelled all the foreign religious later that year, Kamen was chosen as Provincial Vicar of the Bulgarian Assumptionists. Arrested by the government on 4 July 1952 for the anti-state offense of being a priest. He was accused of leading a Catholic conspiracy against the Communists, and was martyred. Born to the Cypriot nobility; his father as the governor of Cyprus. Married briefly, and father of one child. Entered the religious life when his wife and child died of disease. Patriarch of Alexandria, Egypt in 608. Archbishop. Known as the Almoner because of his generosity to the poor. Helped refugees from Persian assults on the Holy Lands. Forced to leave Alexandria when the Persians threatened to overrun it, he returned to his home on Cyprus. Predicted the date of his own death. Baptized on the day of her birth, the youngest of the twelve children, she was raised in a pious family, the daughter of a small businessman who ran a combination pharmacy and grocery in the heart of Verona, Italy. When her fathers died, Luigia took over the family finances. Spiritual student of Blessed Charles Steeb. Nun. Co-founder, with Blessed Charles Steeb of the Sisters of Mercy of Verona to work with the elderly and with abandoned girls; the first group of sisters organized on 2 November 1840, and made their first profession on 10 September 1848. The Sisters continue their good work today in Italy, Germany, Portugal, Albania, Tanzania, Angola, Burundi, Argentina, Brazil, Chile, and have been joined by the affiliated Laity of Mercy. Son of Greek immigrants to Italy. Spiritual student of Saint Nilus of Rossano. Monk at the monastery of Grottaferrata, Frascati, Italy, a house with Greek Rites and Basilian Rule. Abbot at Grottaferrata for forty years, completing the construction and other work started by Nilus, work that turned the monastery into a center of education and manuscript copying, and so extensive that he is often listed as the founder of the house. Hymn writer. Skilled calligrapher. Responsible for persuading the corrupt Pope Benedict IX to resign the papacy, reform his life, become a monk, and do penance at Grottaferrata. Monk at the monastery of Saccudion, Asia Minor in 781. Ordained c.787. Abbot of the Saccudion monastery in 794. Abbot of the Stoudios monastery outside Constantinople in 799, which caused him to be the spiritual teacher of many wise and holy men. His writings include the first recorded stand against slavery. Fought iconoclasm. These opinions and writings put him in conflict with imperial authorities, which led to him being exiled three times. Nun, member of the Sisters of the Resurrection. Superior of her house and director of training for her sisters. One of the 108 Polish Martyrs of World War II. Son of a Scythian officer in the imperial Roman army. Soldier in the same army, he distinguished himself in the defense of the city of Rome. During the persecutions of Decius, Mercurius was ordered to sacrifice to an idol; he refused. Martyr. Reported to appeared and fought with the Christian forces in the First Crusade. Dominican lay tertiary in the archdiocese of Nagasaki, Japan. Martyred in the persecutions of Tokugawa Yemitsu. Founder of the Saint Martin of Tours monastery in Liébana, Asturias, Spain, and served as it's first abbot, a house that became a noted Benedictine stronghold. Raised in an English monastery. Monk at Othelle. Missionary bishop in Belgium. Founded the monastery of Malonne near Namur, Belgium. Son of Galla, who became a nun in later life, and Saint Eucherius of Lyon; brother of Saint Salonius of Geneva. Educated at Lérins Abbey where he became a monk. Bishop of Vence, France. Sixth century hermit in Santomenna, Abruzzi, Italy. Son of Saint Brychan of Brecknock. Fifth century founder of a church in Gwynedd, Wales which has a healing well nearby. A church in Llanllyfni, North Wales is dedicated to this saint, but no information about him has survived. Fifth century bishop of Lyon, France. Members of the Brothers of the Christian Schools, Discalced Carmelites, and Carmelite Tertiaries of Education who were martyred together in the Spanish Civil War.